Dec 13-14: Geminid Meteor Shower. Dec 21: Winter Solstice - the sun is at its lowest point in the sky. It's the shortest daylight of the year and the beginning of winter. Dec 24: Christmas Eve: Watch for a blinking red light and reindeer in the night sky! Cupid, Donner, and Blitzen are making their rounds!!! Merry Christmas! Dec 29: Hamburg/ East Aurora Christmas Bird Count. 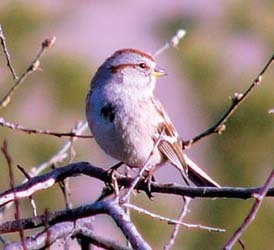 Jan 1: Dunkirk/Fredonia Lake Erie Bird Club Christmas Bird Count. Raptor migration is essentially over by mid-month. Bald Eagles may be seen along the Niagara River. Nest-building begins. Babies born mid-March! 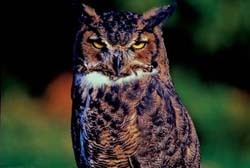 Great Horned Owls are pairing up this month. Listen to their "Who's awake? Me, too!". long-tailed ducks, mallards, goldeneyes, and numerous gulls along the Niagara River. both Crossbills, Evening Grosbeaks, and Pine Grosbeaks!